A good hairstyle can change a person’s look in no time. Even a complete makeover starts with styling the hair based on an individual’s look, face cut and at the same time the length of the hair. If you have medium to long hair, then there are varieties of haircuts and styles you can go for. If your hair has a good volume, then there are plenty of Hairstyles with Side Bangs that may suit you. But there is no hard and fast rule that all of them will look good on one person. It is important that one should understand the need and the style and then incorporate the same when it comes to the haircut. There are experts who might help you in choosing the perfect haircut for your need and concern. Here are some haircuts where side bangs are used, and those, in turn, will help in giving a total makeover that one wishes to have. Women who have medium to long hair should definitely try layer cut with bangs to get a remarkable look. The hair cut is simple with the long-layered cut on both sides and bangs that help in enhancing the look from all sides of the face. 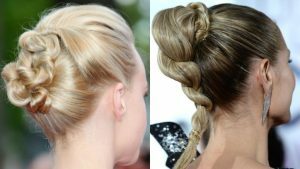 This hairstyle is easily manageable and can be carried with all kinds of clothing and on different occasions. Just let loose your hair with this haircut, or you can color the strands, and you are good to go. If you are tired of having long hair and want to cut it short, then there is the variety of haircut that you can choose from. Cutting your hair short and having bangs to it will help in giving and different and stylish look. You can also add some pastel colors such as pink if you are blonde to this striking wavy hairstyle and pump up your overall look. Smooth and silky hair deserves a different and contrasting haircut based on an individual’s look. If you are among those women who love a simple yet stylish look, then the long-swept side bangs cut is the one hairstyle that you definitely should opt for. The haircut is given keeping in mind the hair texture and the smoothness of the hair. The bangs are cut in long length and the side swept is added in this style to enhance the elegant side a woman. If you have straight hair and are confused on what kind of haircut will suit you, then this particular haircut can come to your help. The haircut is simple yet stylish at the same time. The bangs are cut short on the side depending on which side it looks best on an individual. This is a go-to hairstyle for people who don’t usually have much time to prep up their hair every day and rush off to work. Long and straight hair looks eloquent with this hairstyle. This particular haircut is designed to give an overall stylish look to the person adorning it. The hairstyle is perfect for people who don’t want to tie up their hair and want to let loose the hair strands. The side bangs are cut from one side that falls to the other part of the face. For women who are fascinated with the short but stylish look, this is one look that is a must if it suits your face and needs. Women with long hair often run out of option of styling their hair; this particular look is perfect for girls and women who have a long hair and want to give a different variation to it. The side bangs are cut on one side that gives all in all different look. If you are somebody who is someone who is always on the radar for an elongated forehead, then side bangs will help to cover the same. A perfect hairdo for women who have short hair but want bangs with those strands. No need of tying the hair or attaching any clips with the same. The cut is designed to keep the hair on the shoulder length and provide bangs on one side of the face. A straight cut look which is bob in nature, but at the same time, it has the addition of bangs cut on one side. For ladies who like carry short hair with a classy touch, this hair is best suited for them. You can color your hair to a different shade such as grey or blonde and carry the look smartly. If the stylish yet sober look is your desire, then you can opt for the side swept bangs which can give a neat look. In this style, you need to cut the hair up to the middle length and part from one side. Let the hair free and set the bangs on the forehead. It can hide your wide forehead and give a good shape to your face. Don’t forget to brush your hair well while going out. Women who love to express themselves as modern one can try this trendy hairstyle with the side bangs. The combination of the side bang and the polished comb hair can create a gorgeous look on your black hair. The hair should be parted on one side, and the side bangs should be pinned in a slight puffy manner at the back of your head. This neat and bold style is appreciated by a huge number of modern women today. The long and naturally straight hair can be combined with the short choppy bangs. This combination of the long hair and the choppy bangs can create an amazing look on your face. The bangs fall on the forehead in this style, and the entire hair is needed to be set free. This messy yet classy looking hairstyle can help you to get a new appearance. Women with round face should try the short, thick bangs on their hair at least once. This can casual and smart looking hairstyle suits well on a thicker hair volume. You can try this style in which the bangs are cut in the shorter length and fall on the forehead. The rest of the hair should be parted from the middle and create a loose ponytail at the end of the back head. Few hair strands should be left wavy and free to get a casual look. You can also try some shades on the hair strands to get the ultimate beauty. Women with wide forehead can have the Updo with Parted Side Bangs. This style is not only gorgeous but also easy to carry. You need to brush the bangs well and let them set on the forehead. Then back brush the rest of the hair and create this style. The few loose strands of the hair can help you to get the smart and casual look in this style. If simplicity attracts you then why don’t you try the Face Framing Side Bangs? In this style, you just need to cut the hair up to the middle length and the front bangs in the shorter length. Then brush your hair well by creating a side part to get this amazing style in a short time. You can highlight the hair strands to get the ultimate beauty. Women who are finding a sweet and smart looking hairstyle should go through the updo with wispy side bangs. This style can make you look younger by giving your face a round shape. You need to side part the hair and let the side bang free. Women with bold look must know about the wavy hairstyle in golden color. You can also add the side bangs to this style to get a unique and filler look. In this style, you need to part the entire hair on one side. The waves of the medium to long length hair can make your appearance stunning. The short to medium length hair can be cut in the wavy bob style to get a modern look. You can give it a complete look by complementing it with the side bangs. The side-parted hair up to your shoulder length can make your appearance smart and bold at the same time. You can color the hair in golden white. Updo hairstyles always look good with the side swept bangs. You can try the bouffant updo hairstyle with the side swept bangs to look gorgeous in the party. You need to keep the bangs on one side on your forehead and take the rest of the hair to create the bouffant updo in a casual manner. If your hair is black, then you can try the mid-length hair with choppy bangs. The choppy bangs are left on your forehead up to your eyebrows, and the rest of the hair is cut up to 3 to 4 inches below of the shoulder. The choppy bangs with sharp ends give your face a prominent and round shape. The beauty of the long hair is known to all. You can cut it in a modern style to get the best look. The long length side bangs suit well for longer length hair. You can keep the bangs free on the forehead and around your face to get the best look. The combination of the longer length hair and the shorter bangs can create a messy look on your personality. These Hairstyles with Side Bangs are trendy in these days for uplifting the charm of the appearances of the ladies. You can pick any of these according to your choice and face cut.